Bright, clear full HD display with viewing features and connectivity options. Full HD (1920 x 1080) resolution in a 16:9 widescreen format for a high level of picture detail and sharp, bold images. Features multiple video format connection ports for connecting to a laptop, desktop or other HD devices. Also includes a USB port for increased connectivity. Easily transition from landscape to portrait orientation. Gives you the option of viewing large web pages with less scrolling. LED backlighting allows a thinner panel design. LEDs also save energy compared with standard fluorescent backlighting and are mercury free. Monitor stand has full adjustability features to maximize viewing comfort. EPEAT Gold certified — has multiple eco-attributes. Ranked in three tiers: Bronze, Silver or Gold. ENERGY STAR certified — meets federal guidelines for energy efficiency. diagonal screen size 23.8 in. dimensions 12.8" x 21.6" x 2"
Dell 24 Monitor | P2417H: More productive than ever. The Dell 24 Monitor | P2417H brings a whole new level of productivity to the work place without sacrificing comfort and convenience. Purposefully designed for comfort and convenience: With a full range of adjustable features, slim borders and multiple connectivity ports. Enhanced viewing experience: Dell ComfortView and Easy Arrange features make work less strenuous and more efficient when viewing vividly clear visuals across an ultrawide viewing angle. Reliable and Responsible: Get complete peace of mind with an eco-friendly design. Purposefully designed for comfort and convenience. Easily adjust your monitor to your desired angle, height, and position so you can enjoy great visuals across multiple monitors with no hassle. A more seamless workflow: Slim borders create a smoother and less obstructed visual experience when working across multiple monitors. Versatility you can count on: Enjoy full adjustability to pivot, tilt, adjust the height, and swivel your monitor to your exact preference. More ways to stay connected: Multiple connectivity ports on the bottom and side of the monitor allow you to easily connect to various devices. The Dell 24 Monitor | P2417H is perfect for professionals who work long hours and depend on a monitor that will display stunning visuals without inducing eye fatigue. Complete clarity: Get excellent picture quality with consistent color representation across an ultrawide viewing angle and a high 4million: 1 dynamic contrast ratio. Work comfortably with less stress: Dell's ComfortView feature helps reduces harmful blue light emission onscreen and with direct current, a flicker-free viewing experience is enabled. A more fluid workspace: With Dell Easy Arrange, you can easily tile and view your software applications side by side. Enjoy peace of mind with Dell services and eco-conscious features designed to keep you moving forward. Enjoy peace of mind with unmatched reliability from the makers of one of the best monitor brand worldwide. Dells eco-conscious design meets the latest regulatory and environmental standards such as ENERGY STAR, EPEAT Gold, TCO Certified Displays, CEL, CECP. 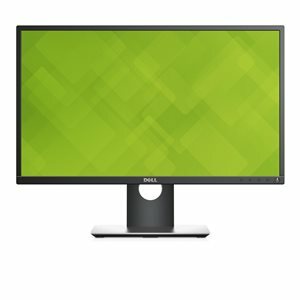 Dell P2417H - LED monitor - Full HD (1080p) - 24"
LED-backlit LCD monitor - 24"